Scattered in picturesque harbour towns like Kas and Kalkan, woven between idyllic coves backed with breathtakingly beautiful gorges, plunging green valleys and dominant mountains, Turkey’s Lycian Coast is a truly beautiful part of the world and the perfect place for a ‘get away from it all’ holiday. If you are looking for high-quality accommodation with a private pool on this stunning part of Turkey’s coast, take a look at these three unmissable villas for a peaceful stay. Aviv is a truly spectacular two-bedroom, contemporary-style villa that boasts remarkable views of the chic town of Kalkan and the sea below. Asides its stylish interior with bright artwork and an open-plan design, focal points of Aviv are undoubtedly its sunken jacuzzi and home cinema projection screen. 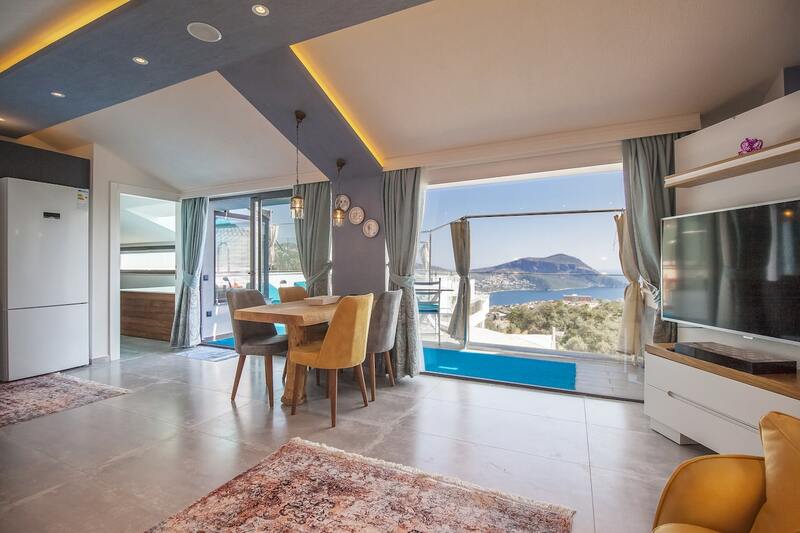 This beautiful villa is located just off the road that links the highly sought-after towns of Kalkan and Fethiye and is just a few minutes stroll to Kalkan and its chic boutiques, bars and restaurants. Another super-stylish place to stay on the Lycian Coat is a townhouse that goes by the name of Lebam. The two-bedroom contemporary town house can sleep four guests in comfort and luxury with Wi-Fi, a sauna, air conditioning, a games room, pool and much more. With an elevated, enviable position, like Aviv, Lebam enjoys spectacular views of the glamorous coastal town of Kalkan below. Just a five-minute downhill drive will take guests into Kalkan, where they can enjoy the many shops, bars, restaurants and facilities this vibrant Turkish town is home to. Described as a “little bit of paradise for those wanting tranquillity,” Mor is a the perfect ‘get away from it all’ holiday home. Mor is located just outside the village of Bezirgan, 18km from Kalkan. This stylish villa has many standout features for a luxury and memorable stay on the Lycian Coast, including air conditioning, a jacuzzi, indoor pool, sauna and hammam, and more. Externally, Mor is geared towards enjoying Turkey’s warm, sunny climate and taking in the tremendous views, with a sports area with basketball and volleyball, a covered terrace with separate dining area and barbecue, a secure walled garden and, of course, a private swimming pool.